Fast bowler Dale Steyn’s ODI comeback reaped plenty of benefit from a Manguang Oval pitch riddled with inconsistent bounce, but impressed nonetheless, writes JONHENRY WILSON. A truly fascinating opening spell was entirely appropriate for the occasion, which had been in the making for several months. 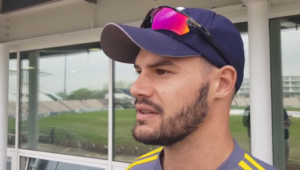 South Africa want the 35-year-old pace ace in the ODI XI for the foreseeable future, certainly as far as next year’s World Cup – and perhaps beyond. Kagiso Rabada’s absence quickly quashed questions about whether Steyn would open the bowling. Brimming with confidence on the back of a maiden ODI half-century – not that additional motivation was necessarily required – the spirited Steyn sprung straight into action. Over one was focussed almost entirely on full length and shape away from the right-handed opening batsmen. Pace was down, but immaculate line and direction on cue. When Steyn started to bang in some shorter lengths through overs two and three, the low bounce that accounted for the dismissal of Reeza Hendricks earlier in the match was again evidenced. This time Solomon Mire was the victim, after Steyn’s wicket-to-wicket approach ensured an affirmative lbw appeal. Overs four and five yielded more examples of conditions former Zimbabwe seamer-turned television commentator ‘Pommie’ Mbangwa labelled, ‘horrible, terrible, not good at all.’ Steyn had no trouble in frequently adjusting lines during a brief partnership between the right-handed Hamilton Masakadza and left-handed Craig Ervine. 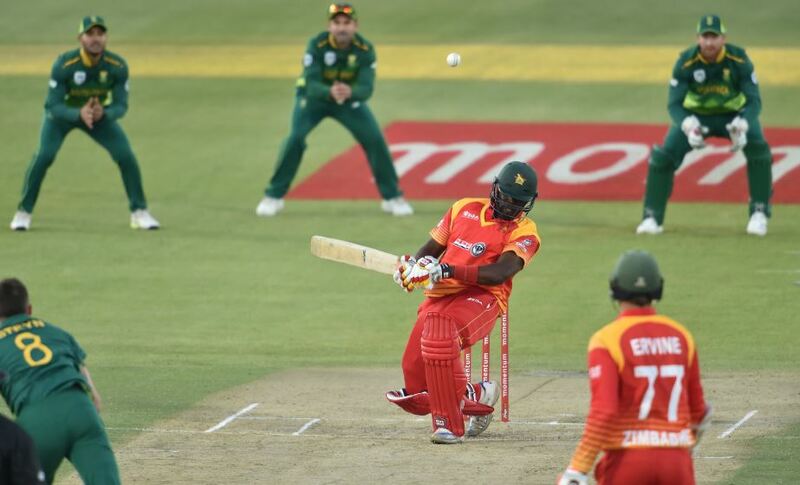 Usually assured, Masakadza’s shot selection was rendered indecisive by Steyn and the pitch. Ervine, meanwhile, weathered a couple of awkward blows to the body and helmet grille. The alarming elevation generated from the large cracks in the deck was spiteful. Eventually bowling at speeds of between 140 and 145 kilometres per hour, Steyn also turned fingers over the seam for a couple of slower deliveries. His rhythm, throughout, looked good – and more importantly free of niggle. At the end of a five-over opening spell, Steyn had figures of two for 16. His first wicket was largely thanks to low bounce, while the second appreciated an outstanding diving catch from midwicket fielder Andile Phehlukwayo. Having bobbed, weaved and fended throughout, Ervine eventually decided to attack Steyn on the pull, but predictable mistiming afforded Phehlukwayo the pouch. Steyn’s figures would have read substantially cheaper, too, had Masakadza not top-edged a six straight over wicketkeeper Heinrich Klaasen’s head. The height of the false stroke and the carry all the way to the boundary epitomised the pace generated by Steyn. Captain JP Duminy rested Steyn after five overs, which allowed Lungi Ngidi an opportunity to exploit the cracks and tailwind from the Willows End. Ngidi did not, could not – exemplify the chasm in experience and talent between Steyn and contemporaries. A fiery late sixth over from Steyn, shortly before victory, reiterated this.